ZMC can be accessed from any machine on the network. Users don't need to remember detailed command line instructions. 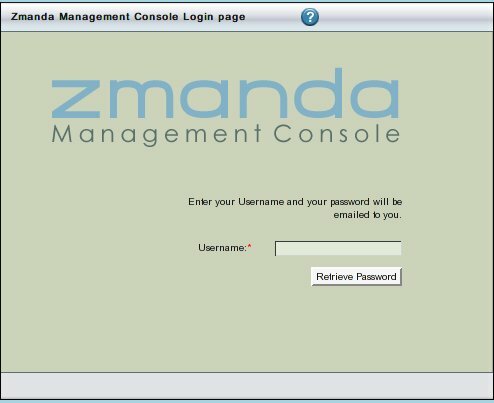 By default, the ZMC web server uses port 80 on the Amanda server. Once ZMC is downloaded and installed it will allow the user to log in with the default User name "admin" and password "admin”. It is recommended that users change the Password as soon as possible. After entering the User Name and Password (Area 1 above), please click the Login Button to proceed further. 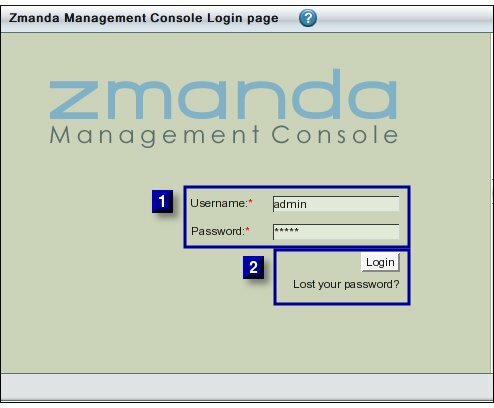 Clicking 'Lost your Password' will cause ZMC to open a fresh dialog where users are expected to enter the user name. Clicking the retrieve button will cause ZMC to send an email to the address provided with a freshly generated password. Please select a new password once logged in. How to change password is shown here.